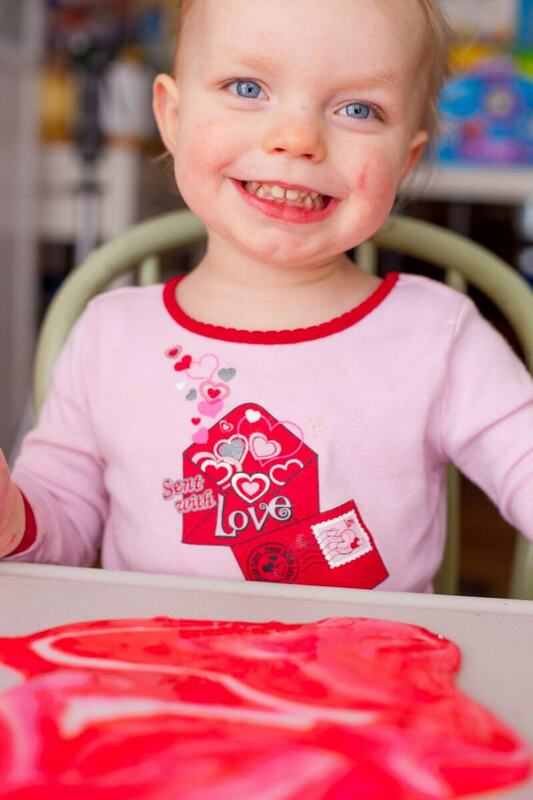 This quick and easy borax slime recipe makes a fun Valentine’s Day activity that provides hours of entertainment. It’s also a great sensory experience! 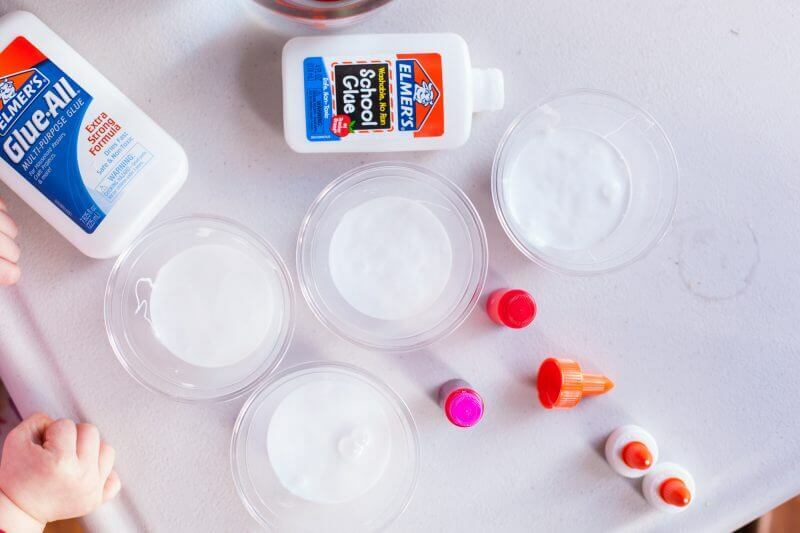 Looking for a Borax free slime recipe? 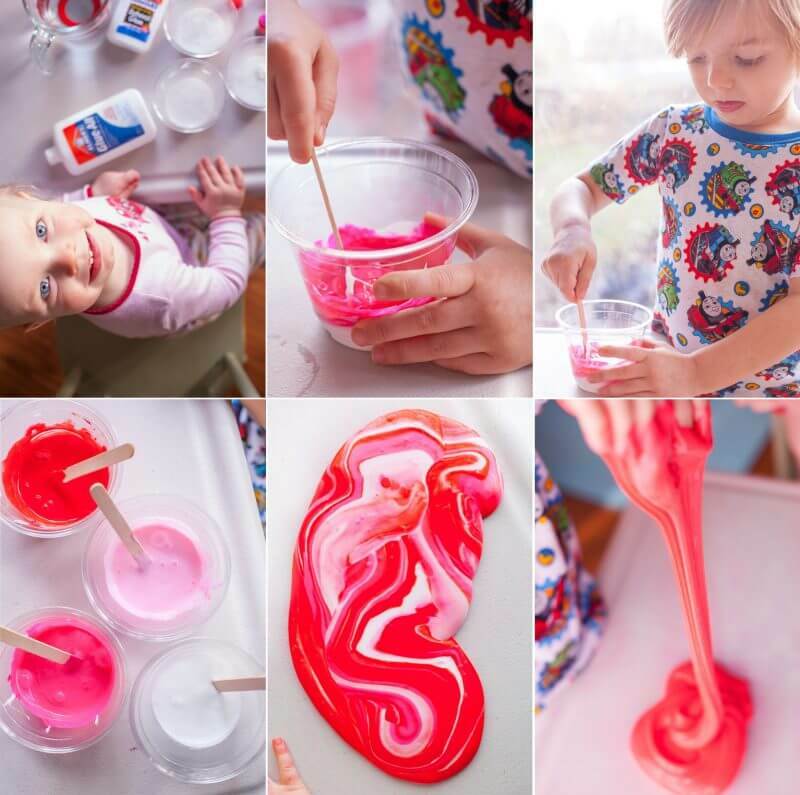 Check out our fluffy slime recipe! Liquid starch and saline solution (or contact lens solution) are both slime recipe activators that can be used in place of Borax. Crafts that require measuring and mixing are a great way to encourage your kids to enjoy both science, and cooking. It’s not just a fun activity, it’s educational! 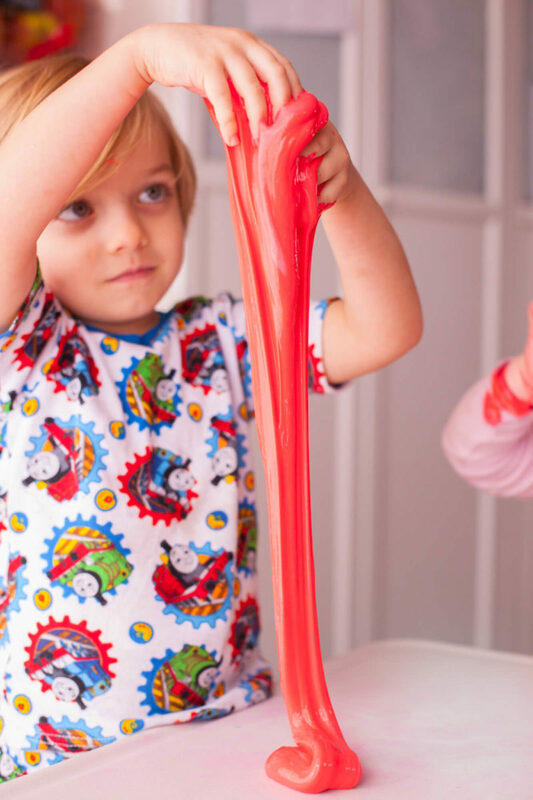 Making slime is one our family’s favorite crafts because the kids love measuring the ingredients, stirring them together, and then kneading it into slime dough. Those are all skills that help them in the kitchen as well! I do always make sure that they know this craft IS NOT edible. 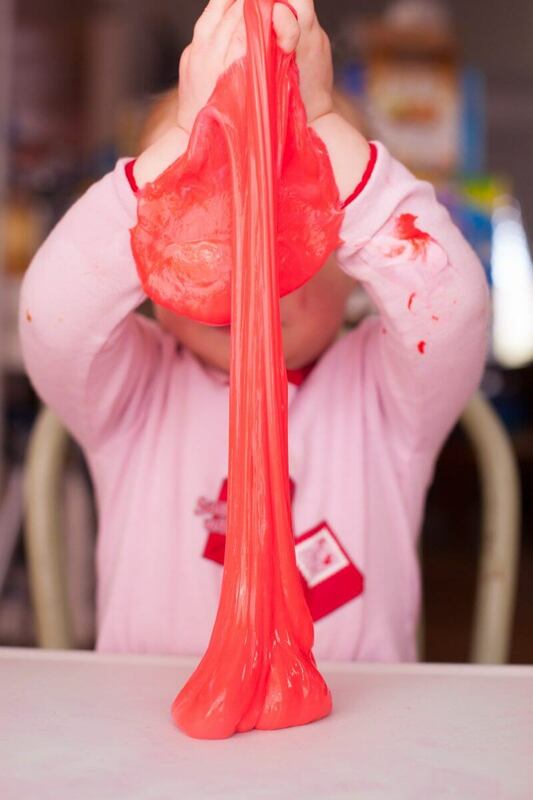 If you want a food safe slime recipe, check out our goop recipe. If you buy anything on Amazon from one of our links, we get a little commission that helps keep the lights one here. Thanks friend! The basic borax slime recipe is really simple. I’ve linked to all the ingredients and supplies on Amazon, but you can get them at your local Walmart, possibly for a better price. Borax is a brand name for sodium borate, a mix of boric acid and salt. It is the simple ingredient that gives the slime it’s awesome texture, and also makes it unsafe to eat. Be especially vigilant once you mix the borax in with the water, so that no one drinks it. We’ve never had an issue with this, and my kids are incredibly oral, but I still keep a close eye on them. Worried about Borax? Put your mind at ease. Borax is NOT absorbed through skin, and must be eaten in large quantities to be toxic. Ounce for ounce, salt is more toxic than Borax! For the glue, I always use Elmer’s glue, but it might be possible to use a generic school glue. Let me know if you’ve tried! You can also use glitter glue for glitter slime or clear glue for clear slime! 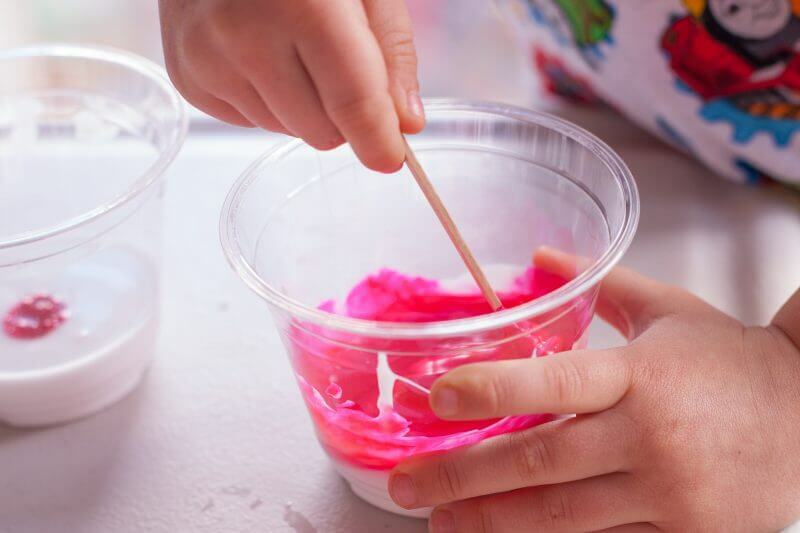 We like mixing our borax slime recipe in clear plastic cups so the kids can see both the color change, and the chemical reaction. Plus disposable cups and popsicle sticks make clean up a breeze! For the colors, you can use any combinations of pinks and red. We have a set of food coloring and used fuchsia and bright red, but only did a couple drops of bright red in one of the cups so it would be a pale pink. An optional supply is some plastic sheeting to protect your work surface. 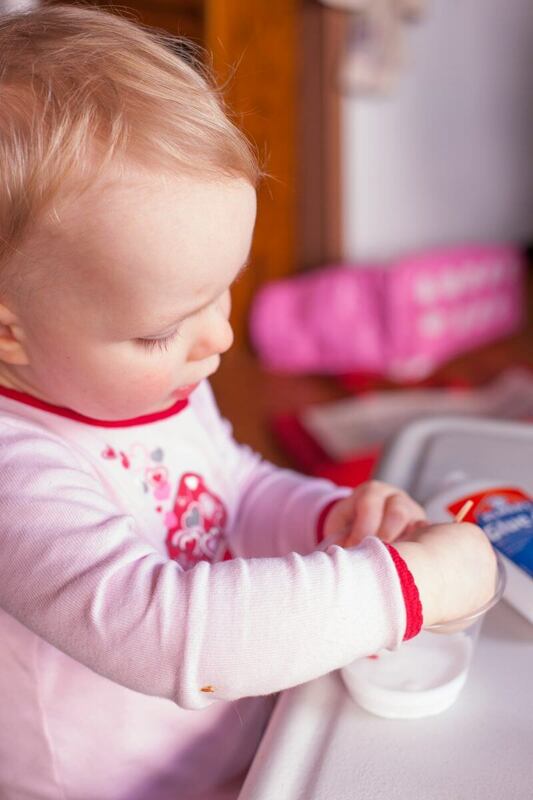 We have an awesome kids’ folding table that cleans up really easily and never seems to stain, but I would definitely put sheeting down to protect a wood table, and wood or tile floors. Start by dividing the glue between four cups. You don’t have to be exact in the amounts, but try to keep it close. You want a little more than 1/4 cup of glue in each cup. Then add your colors. We do a few drops of red in one, a single drop of red in another, and a few drops of fuchsia in the third. The fourth one is left white. The next step is to dissolve the Borax into a cup of water. Make sure it’s warm water or your Borax won’t dissolve and you’ll get sad grainy slime. Trust us on this one. You want a water mixture that basically seems like it’s just water. Now you can add 1/4 cup of water to your first cup and start stirring immediately. Eventually it will either get too thick to stir, or need a little more borax water mixed in. Once no more water will mix into it (the perfect slime recipe! ), take it out of the cup and start kneading it with your hands. Not sure about the desired consistency? It’s really up to you. 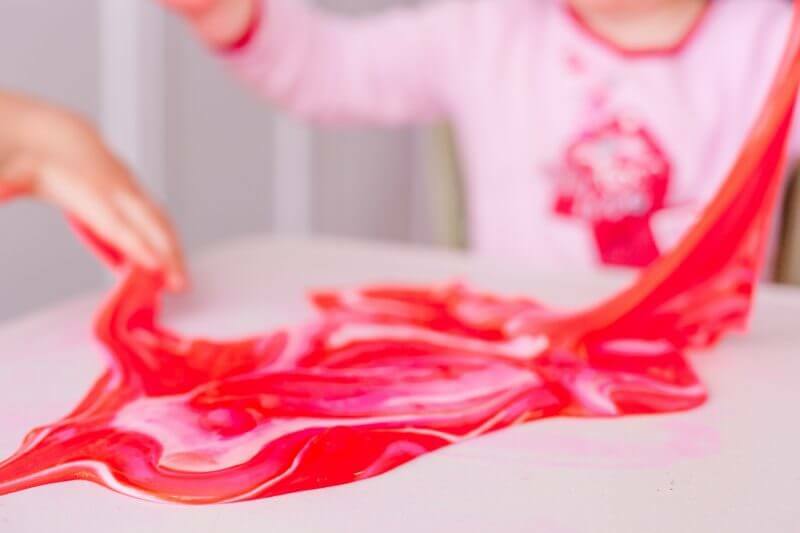 We prefer to create slime that is not super sticky, so for us the perfect slime recipe will stick and cling when manipulated slowly., but then it will hold together and come off easily when you move quickly. It’s so fun for your kids to learn how to manipulate it! Repeat that step with each cup, and then start mixing the four colors together. Eventually you will go from multicolored slime to a pretty pinkish red. You can store the slime in an airtight bag and use it for several weeks for hours and hours of sensory fun. Just be warned that it does stick to clothes, so I learned quickly that my two year old needed to be in nothing but a diaper for this project! If you do get slime on clothing, just soak it in some vinegar and the slime will come right out. You can simply wash your hands to remove any slime stuck on them from the slime making process. 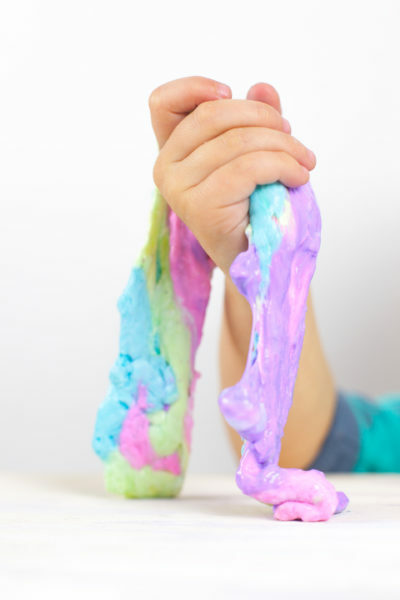 We hope you love this Borax slime recipe as much as we do! And make sure to check out our Easter Egg Slime. 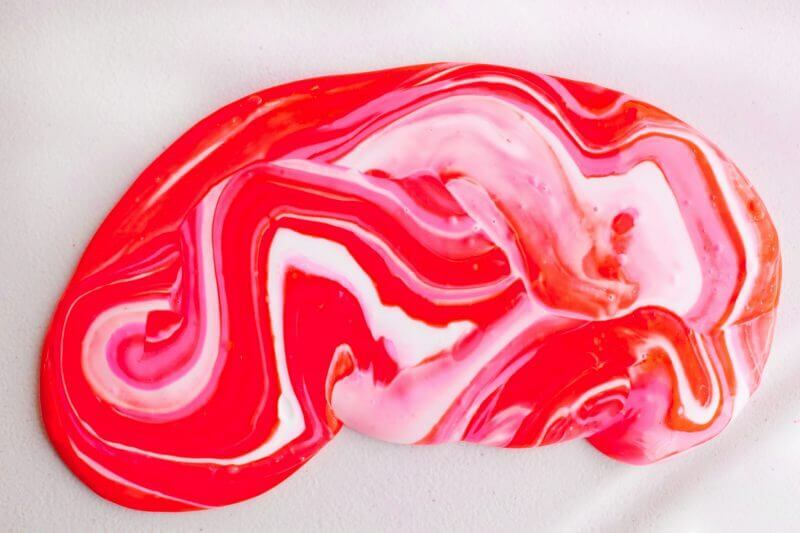 This Valentine's slime is a fun sensory craft for kids, and a great way to encourage cooking skills like measuring, and kneading. Makes enough for two kids to share without fighting! Divide the glue between four cups (2.5 oz in each). Add 3-5 drops of red to one cup, one drop of red to another, and three drops of fuchsia to a third. Mix well with popsicle sticks. Pour 1/4 cup of the borax water into a glue cup and immediately stir. You'll see (and feel) it start to thicken immediately. Just keep stirring it until it's too thick to stir, adding up to another 1/4 cup of borax water as needed. Then remove it and knead it in your hands until the stickiness goes away. Repeat with each glue cup, until you have all four colors. Then press the colors together by hand. Store in a zip top plastic bag when not being played with.